"This bar had the most unique selection of draft beers that my fiancé and I have ever experienced! The GM, Josh, was very welcoming and really knew his beers....I tried the New Mexico Burger and my Fiancé tried the Green chile turkey sandwich... Both were amazing! !...If I ever go back to Albuquerque I would definitely stop in!!" "Cool little cafe. Lisa at the bar was wonderful. The crowds were loud and happy. Only beer but many selections on tap. Very clean and neat. Hard wood floors. No TVs. Ordered the 3 leches cake. Delicious. I'd come again"
"so very disappointing! we ordered a hamburger medium-well, & it came out raw. sent it back to the kitchen & it came back raw the 2nd time, too...totally disappointing, & we definitely won't return." "New vibe, new decor, fancy printed menus, no more live music. I get the music thing, it was always too loud and cramped BUT they could have been acoustic only or something....No more grit, no more edge. Bikes that used to hang from the ceiling are gone....Waitress asked how we liked it, ehhhh mmmmm ya, we like the old place better. She told us it would be on Restaurant Impossible next week. Ahhhhhhh now it makes sense!" "The decor changed also and it seems like they made their place more generic looking. I liked the look they had before and not too sure why they felt the need to change everything. The atmosphere is nice still and the beer selection has not changed ( good thing )..."
The Restaurant Impossible makeover happened in October 2014. Here is the Shade Tree Customs & Cafe website and here is their menu. 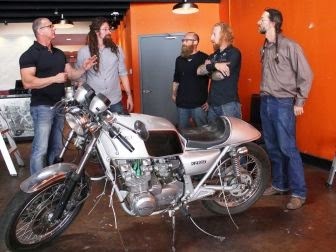 The About Us section of their website details how they went from a motorcycle shop, to a cafe, to a full restaurant in 2013. Here is the Shade Tree Customs & Cafe Facebook page, which is kept up to date. After opening in Fall of 2013, they were already expanding their restaurant in March of 2014 (Link). In September before the makeover, they posted this on their Facebook page, "DAMN THE MAN SAVE THE SHADE TREE!! !...Shade Tree needs your help! We are in danger of closing our doors for good so grab your friends, family, coworkers or that nice fellow in the street and come save us." (Link). I couldn't find the post on their Facebook page, so maybe it was taken down. A review on Yelp stated, "Ok yall shade tree has been through some amazing changes new staff new menu items and weve brought back some of the favorits. And yes the old signs are coming back weve had a hard year and thank you for your continued support. ..much love. Ryan..s.tc." So I guess they are bringing back their old signs. On January 5th, 2014, Shade Tree said they were bringing back live music to the restaurant (Link). Here is a blog post review about the restaurant, which has positive things to say about the food. Here is a minute and a half video which is a commercial/advertisement for Shade Tree Customs & Cafe. The reviews before the makeover complemented the beer selection and food, but there were a lot of complaints about wait times. The reviews since the Restaurant Impossible makeover have been mixed, with people still complementing the beer selection and some people liking the food. There were some comments about the new decor taking away the vibe of the restaurant and making it seem more generic. It seems like the restaurant may have expanded too quickly, which caused money issues and Restaurant Impossible thought their story of a garage/restaurant would make for good television. Isn't it time to RETIRE this show? I avoid it at all costs anymore...I'm so tired of the Popeye Persona of Robert Irvine and the perpetual failure of his superhero antics. The blog post review you linked to is a good one! Gil Garduno has been reviewing restaurants here for years & reviews only independents, not chains. When he travels, we get reviews from where he traveled to, but most of his posts are about NM independent restaurants. He does a great job! I think Robert made the restaurant too sterile. It looks like it lost all its cool factor. Was this a backdoor pilot? Meaning that these guys look like they could easily front a reality show. If you avoid it all costs, why are you here? This most recent episode tells me that RI can be saved......as long as they stick to dealing with normal people that need business help.......not personal counseling. But the "cool" factor wasn't translating into consistent business. So was it really "cool"? You can swing it too far the other way. A small improvement in the food, and improving the doorway to the shop, would have helped. I agree Cakester. It was refreshing to watch an episode where the owners seemed to genuinely like each other, the staff wasn't hating on the owners or management & no one was married & fighting. Steve I live in Albuquerque & have heard nothing like that. The only press or talk on the street about this place was the makeover itself. I think had it been a pilot of any sort or if there might be one, I'd likely have heard something by now. I could be wrong, but I read a lot of local blogs that cover the food scene, visit many independent restaurants & know many owners, so far nothing. Who knows though?? I liked that part of the episode, but I think they focused too much on the motorcycle aspect. I think the Restaurant Impossible trivia question should be related to food. I agree that it should be about food. It's me, the Pioneer Woman! I was waiting for you Lenny! I left the back door open! It looked like a garage before, not a place to eat. Robert said how boring the food was then he just gives them a lame burger and a steak with rice and salad, like that is supposed to change anything. DANG!!!!! I be high tailin it right on yonder der! RI did change the food and a doorway to the shop. Sure you could make small tweaks, but are you willing to take that chance when you are losing thousands of dollars a month out of your pocket? The restaurant was failing horribly, so small, incremental changes were unlikely to make a noticeable difference. This was one of the best episodes in a long time. Finally a show about what was going wrong with the running of the restaurant, and not about drama. These guys actually seemed like a good group of people and I hope they do well. First episode in a long time where Robert didn't scream at someone. LOL @ Epic Fail...I agree. And, yes, Kortni, but especially Sarah. Cuckoo, cuckoo. Nah, he just ran out of sandwiches. He seems like a nice guy, but his cooking skills are nothing special. At least she stop referring to her pretend "hubby", everyone knows she is gay I would think, no big deal. I actually called DirecTV & rather than what the price used to be, it was just $10 to move up so that we can get the Cooking Channel! I was so happy & now I can enjoy that. I hope they don't ruin it like FN. Oh no! I just wrote above that I was getting it now. I hope it stays good! I have to agree. The last few times I've seen him left thinking blah.